Following a particularly severe 2017-2018 influenza (flu) season with a record-breaking estimated 900,000 hospitalizations and more than 80,000 deaths in the U.S., the National Foundation for Infectious Diseases (NFID), along with public health and medical organizations, presented the benefits of flu vaccination and urged the public and healthcare professionals to follow the Centers for Disease Control and Prevention (CDC) recommendation that everyone age 6 months and older get vaccinated against flu each year. 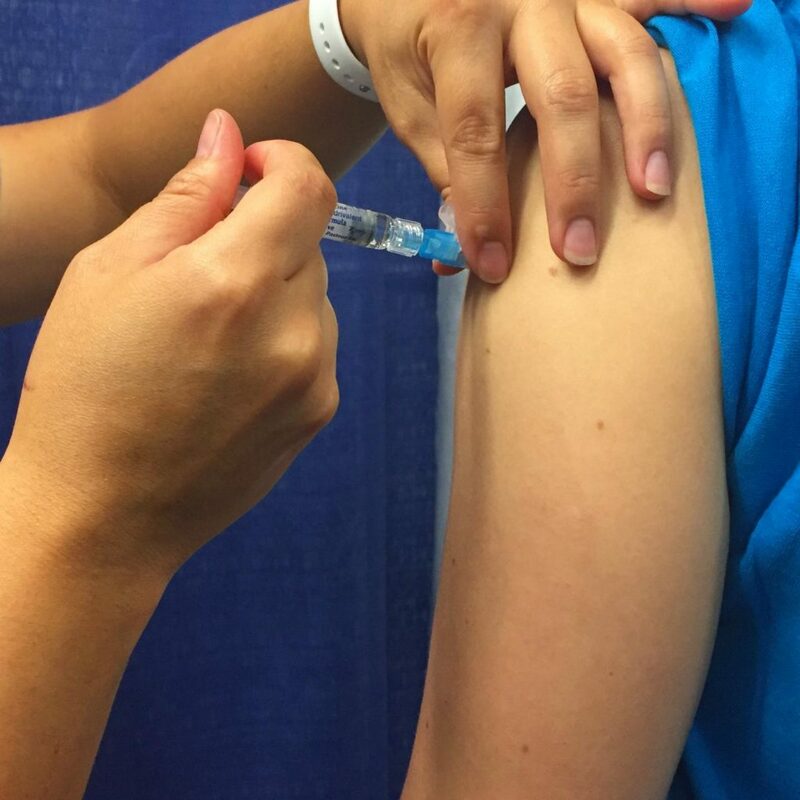 A person receives the seasonal influenza vaccine (flu shot). These new estimates are record-breaking, and emphasize the seriousness and severity of flu illness and serve as a strong reminder of the importance of flu vaccination. For the last several seasons, flu vaccination coverage among children age 6 months to 17 years has remained steady, but has fallen short of national public health goals, which are 80 percent. During the 2017-2018 season, a small decline in coverage of 1.1 percentage points overall was observed (57.9 percent compared with 59 percent during the 2016-2017 season). Children age 6 months through 4 years had a decline in vaccination coverage of 2.2 percentage points. Young children are at high risk of serious flu complications because of their age, and a potential drop in coverage in this age group is concerning. Despite the drop, vaccination coverage remained highest in this age group (67.8 percent) and lowest among children ages 13 to 17 years (47.4 percent). There was a large geographic variability in vaccination coverage among children, ranging from a high of 76.2 percent in Rhode Island to a low of 43.2 percent in Wyoming. During the 2017-2018 season, 180 influenza deaths in children were reported to CDC, exceeding the previously recorded high of 171 for regular (non-pandemic) influenza season. This number is thought to be underestimated, as not all flu-related deaths are reported. During most influenza seasons, about 80 percent of reported pediatric deaths occur in children who have not been fully vaccinated against flu. Flu vaccination has been shown to reduce the risk of flu illness, and a growing body of evidence supports the fact that vaccination also reduces the risk of serious flu outcomes that can result in hospitalization and even death. CDC estimates that flu vaccines prevent tens of thousands of hospitalizations each year and a CDC study in 2017 was the first of its kind to show flu vaccination reduced the risk of flu-associated death by half (51 percent) among children with underlying high-risk medical conditions and by nearly two-thirds (65 percent) among healthy children. Most recently, an August 2018 study showed that flu vaccination lessened the risk of severe flu among adults, including reducing the risk of hospitalization and admission to the intensive care unit, and also lessened severity of illness. These benefits are especially important for people at high risk of serious flu complications, like people 65 and older, children younger than 5 years, pregnant women and people with certain underlying long-term medical conditions like heart and lung disease, or diabetes.